When you UNDERSTAND how German adjective endings work, you only need to learn ONE TABLE! declining it until the common sense is all declined out of it. Every time I had to teach German adjective endings I was really happy that I had already learned it naturally as a child; so, today I “just know” how it works. This topic is one of the most difficult of basic German grammar, and I have never known a student who hasn’t struggled with it. I’m not surprised! Very often we, teachers, give our students simply 3 or 4 tables, which they have to learn by heart. And the textbooks most of the time don’t contain any better ideas. Many textbooks try to totally avoid any tables and treat the adjective and several accompanying words only incidentally, in the hope that the students practice and learn the rules of the German adjective endings more or less unconsciously. Sooner or later, some tables are given all the same, – although most of the time they are very unmethodical. Nobody is able to memorize this and to learn the German adjective endings this way. Well, that´s what I think, at least :). 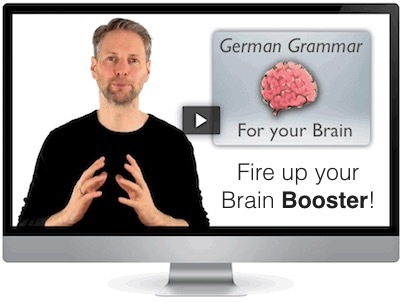 your life with the German adjective endings will be a lot easier. 1. Case-endings are in principle identical with the definite article, but without the “d”. These case-endings are sometimes also used by other accompanying words, we call them then strong endings. Strong endings always indicate the case! They are also used by the demonstrative pronouns (dieser, dieses…), and often as well by the indefinite articles (ein, eine …) and sometimes by the possessive pronouns (mein, dein, sein…). They can also be used by the adjectives. But when do accompanying words use strong endings and when do adjectives use strong endings? 2. In an “adjective-noun” (noun + adjective) there is always EXACTLY ONE case-ending. So, you don’t really have to learn a new table, because you already know the articles with their case-endings. And every time there is no case-ending in the words which precede the adjective, there has to be a case-ending in the adjective; precisely as I explained to you above. In principle you now really only have to learn one table, and this is for the cases where the case-ending precedes the adjective. This way I finally understood the declension of the adjective! Get to know the only table, that you have to learn for adjective declination. Remember this table permanently, after only one glance! Learn why this pot will help you with this. from Neustadt, Germany, developed an excellent overview and allowed me to present it to you on my website. She managed to integrate adjective and article declinations in only one table. Moreover the relationships between the interrogative pronouns, the declension of the article and adjective and the personal pronoun are developed. Anna has done a really great job. In the video I explain, how the table works an how you can use it immediately in you German lessons.